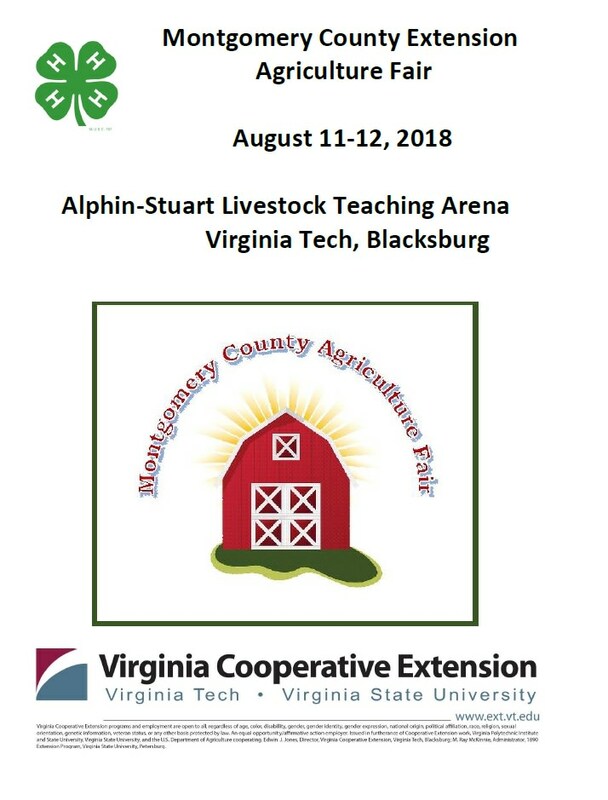 The 2018 Montgomery County Extension Fair will be held on Saturday, August 11, 2018 and Sunday, August 12, 2018 at the Alphin-Stuart Livestock Teaching Arena at Virginia Tech. The fair includes a livestock and horse show, exhibits, demonstrations, fair games, activities for kids, and more! For many of the youth activities, both 4-H and non 4-H members can participate (fair exhibits, games). Adults are also eligible to enter fair exhibits. Sunday features the 4-H Rough Riders and Country Kids Benefit Horse Show. Lunch concessions will be available on both Saturday and Sunday. View the 2018 Fair Catalog at https://tinyurl.com/18montfair. To view the Saturday events, visit: http://www.nextthreedays.com/FeaturedEventDetails.cfm?E=480398. To view the event flyer, visit: https://i.imgur.com/cCz8u0W.jpg. For more information, visit: https://montgomery.ext.vt.edu/ or https://www.facebook.com/Montgomery-County-Cooperative-Extension-152579374924209/.